If you like your fruit juice fresh, your olive oil extra virgin and your cider aromatic, there’s good news: an electrifying new technology is making those goods easier to produce – and even healthier. It's a non-heating technology so it avoids the negative effects of heat on food. The family-owned Apple Farm in Cair, Ireland, grows 600 tonnes of apples per year. A quarter of the harvest is processed into juice, cider and vinegar. Now the farm has joined a European research project to improve food processing using pulse electric field, or PEF, technology. 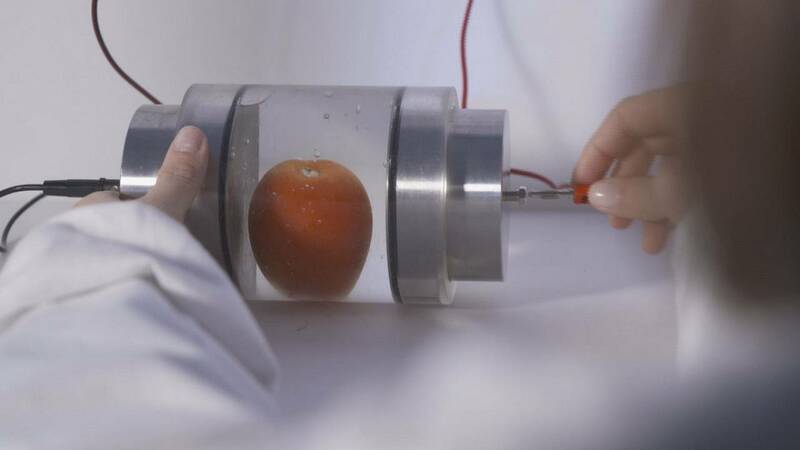 This high-voltage treatment helps extract more juice from certain fruits. “The ideal conditions to use this is when we have hard apples, apples that are not very long picked, maybe the first few weeks after harvest,” explains Cornelius Traas, who owns The Apple Farm. “And when we put them through this process, we get an increase of yield of maybe three to four percent”. Electric pulses in the treatment chamber perforate fruit cells, which simplifies juicing. A modification of the same technology can also kill microbes, increasing shelf life of fresh juice. Traas is waiting for a smaller chamber to arrive, where they will be able to apply a greater charge to the apples in a smaller area. “When we do that, we’re hoping that we not only split open the cell membranes of the fruit, but also much smaller cells like bacteria [and yeasts, to avoid using preservatives],” Traas says. PEF is not just about apples: a laboratory at the University of Zaragoza is producing red wine from grapes processed with PEF. By creating pores in the grape skin cells, PEF shortens their maceration time without affecting the taste. “There’s a change in polyphenols. For that reason you can sense, see, that the wine processed with PEF has a deeper colour, has more polyphenols than non-processed wine”. The researchers also want to showcase the commercial advantages of PEF to food companies. Initial investments in the technology could be reduced with the development of cheaper pulse generators. Best of all, running energy costs can be surprisingly low. “The process requires high voltage, but the treatment is applied as very short pulses, at the microsecond scale – that’s one-millionth of a second,” says Elisa Luengo, a researcher in food processing, University of Zaragoza. “So the total energy requirement is very small. Treating a kilo of tomatoes requires less energy than heating one litre of water by one degree”. Tomatoes processed this way are easily peeled without using boiling water. That saves energy and helps the environment. PEF treatment also preserves the nutritional value of vegetables, meaning the food industry can produce processed foods that are tasty and healthy. “This is a non-heating technology, so it avoids the negative effects of heat on food makeup, so the consumer will receive products with better sensory qualities and more nutritional value,” says Javier Raso, professor of food technology at the University of Zaragoza. Researchers say that pulse electric field technology is particularly suited to small- and medium-sized food processing companies. It’s an innovation that could juice up their competitiveness in the market.